Long-serving Channel 4 journalist and presenter Jon Snow discusses ‘Charismatic leadership – the role of the media’. Recorded at the Daedalus Trust-RSM conference ‘Leadership: stress and hubris’ in London, November 2014. 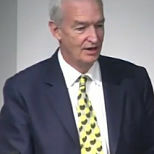 Jon Snow also appears in the Panel Discussion video, filmed later in the day.